A mirror reflects the image of surroundings. A mirror also conceals the human body or the object it is attached to. 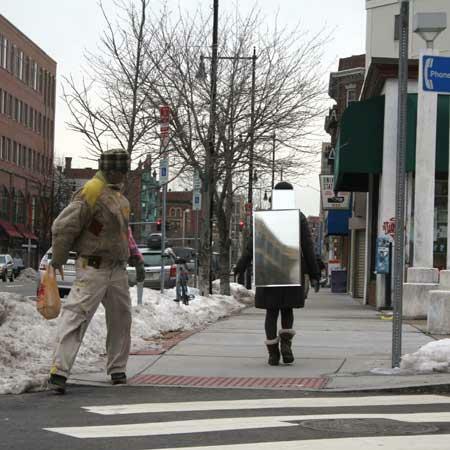 Wearing the mirror in the urban space creates the reflective identity that one has in cyberspace. One's identity is determined by the information that varies depending on which virtual/cyber space one is in, such as Facebook or eBay. Therefore, in the virtual space one loses one's fixed/physical body and experiences with one's reflective identities that change with different environments. Likewise, by wearing the mirror in the physical space, one conceals one's fixed body and reveals the reflective identity that is changed by surroundings. We installed the mirror at the back of a vehicle and drove slowly on the road in order to create more chances for people to confront themselves in the public space.